If we have an issue with something integral to the way we look, then, it can be a real issue, and incredibly detrimental to our confidence. This can be a particular problem when people are unhappy with the general appearance of their face – if they feel their features are not prominent enough, or that an aspect of their facial composition is out of proportion. A common facial feature that people take issue with is the shape or size of their nose. If you are unhappy with the appearance of your nose, you can undergo rhinoplasty surgery in order to improve your nasal shape. This could address a tip that is too pointed or bulbous, as well as any lumps or unwanted width in the bridge of the nose. Rhinoplasties can be performed in one of two days: open or closed. There are pros and cons to each but an open rhinoplasty generally allows more intricate refinements to be made especially if nasal tip work is required. During a closed rhinoplasty, Mr. Chana has limited access to the nasal tissues so this approach is usually reserved for cases where minimal work is required to the nasal tip. You can read more about the difference between open and closed rhinoplasty procedures here. Why is a chin implant required? In some situations a large or overprojected nose can be overemphasised by a small chin. This is where a chin augmentation procedure can be very helpful in enhancing the overall proportions of the face as a whole. In these situations a combined procedure of a chin implant together with a rhinoplasty can provide very good results since both procedures can complement each other. How is a chin augmentation carried out? Chin augmentation is a fairly straight forward procedure, in which an incision is made (either inside the mouth below the bottom row of teeth, or externally underneath the chin) and a small silicone implant is placed in the ‘pocket’ that has been created. The surgery is performed under general anaesthetic, and takes about an hour to perform. Chin implants are usually made of solid silicone. The shape and size of the silicone chin implant can vary and will be decided at the time of a careful examination during the consultation with Mr Chana. 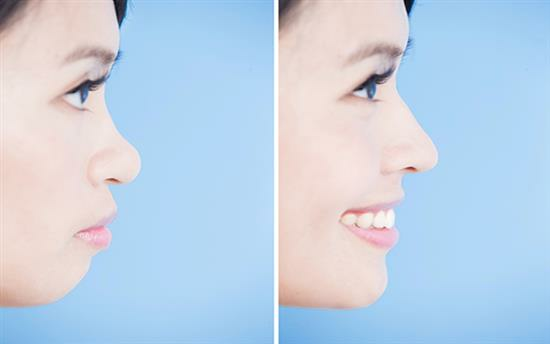 A typical result of a rhinoplasty and chin implant performed together is shown below. This patient came to see Mr Chana wanting a rhinoplasty and after careful discussion it was decided that a chin implant would further help refine and strengthen the facial proportions. Performing these procedures together is not uncommon. The end goal is to achieve pronounced but proportional features that you are happy with and that provide facial harmony. To move forward with your cosmetic surgery journey and improve the appearance of your face on the whole, you should book a consultation for an in depth discussion of each procedure with Mr. Chana. In fact, a few patients who request a consultation for rhinoplasty surgery to reduce the size of their nose occasionally just end up undergoing chin augmentation alone since it was the chin which is retrusive and small and not the nose which is large – fewer people know about this surgery and might not have even considered that it was their chin that was the problem. Your consultation will not only offer the perfect opportunity for Mr. Chana to assess your face and advise which surgical plan might be most appropriate for you, but also for you to ask any questions you might have about cosmetic surgery. Undergoing cosmetic surgery, particularly on the face, can be life-changing and – although it often dramatically enriches the life of the patients, who enjoy increased confidence and therefore their quality of life – and it is therefore not a decision to be taken lightly. Mr. Chana will assess whether you are a suitable candidate for the procedure, undertake a careful examination and discuss the likely result that can be achieved and any associated surgical risks. Above all else, though, a consultation will allow you to talk to Mr. Chana one on one before he goes on to perform your surgery. Patients consistently report that meeting with their surgeon before their surgery allows them to feel more at ease. Very often Mr Chana will see you twice before surgery in order that you are fully informed about the procedure and fully understand every aspect of the process of surgery. Remember, you should never undergo surgery with a clinic or corporation where your surgeon has not met with your beforehand. If you would like to book a consultation with Mr. Chana, please call or email his clinic today.